Proper exercise for dogs is important to their overall physical and mental wellbeing, but often “mental exercise” is given short shrift when looking at fulfilling a dog’s needs. Dogs that are bored and that have little mental and environmental stimulation can develop mild to severe behavioral problems as a result. 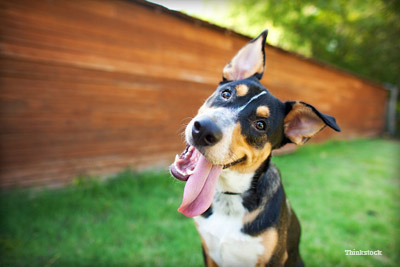 Providing your dog with “brain exercise” is easy to do – here’s some ideas you can try out! Obedience training can be more than just simply teaching your dog sit, down and other common manners and behaviors. Training your dog to learn a new behavior asks him to think and learn and engage his brain. You can become creative in what you teach – tricks are one wonderful way of constantly keeping your dog learning while enjoying an activity that’s fun for both of you. Using a clicker to train is an excellent way of teaching your dog complex behaviors and you can use it to “shape” behaviors as well. “Free shaping” is another type of training where you “shape” small increments of behavior based on what your dog does in a given situation. A typical example would be the well-known “101 Things to Do With a Box” exercise from clicker training expert Karen Pryor. There are many wonderful options available today for you to continue in classes with your dog, such as classes on teaching tricks, therapy dog training, and a whole host of dog sports such as agility, rally, canine freestyle, scent work, barn hunt and much more. You don’t need to become a competitor in these sports either, many classes are a mixture of serious competitors and dog parents who just want to have fun with their dogs, so don’t be intimidated to try one! Certified Dog Behavior Consultant and Associated Certified Animal Behaviorist Katenna Jones encourages guardians to take the plunge: “I love classes that cover skills beyond the basics. My favorite class I teach is Brain Games, where dogs learn things like riding skateboards, color discrimination, and more. Classes and activities like this are rewarding for you both, great for bonding, improve communication, and tire out brains and bodies.” If you don’t know what kinds of classes are available in your area, visit the International Association of Animal Behavior Consultants website to find classes in your area. Take your dog out on more than “just a walk.” Find places that are richly varied in terms of sounds, sights, textures, odors and more. A dog’s sense of smell is much stronger than ours and allowing him to “see” the world through olfactory senses can really stretch his mind (hence the popularity of scent work classes and competition). Rather than taking your dog on the same walk every day, along the same path or sidewalk, look for places that may have new smells, or an abundance of them, such as parks or forest trails you don’t usually go to. On the reverse side, find dog friendly urban walks to change up the pace. You can even add in some elements of “parkour” to your walks by having your dog go up onto obstacles such as curbs, steps, benches, and playground equipment – be creative, but make sure that nothing is too high or unsafe for your dog! 4. Games toys and puzzles for dogs! Games are a fun way of activating your dog’s mind, as well as building your relationship together and teaching your dog to see that spending time with you is the best reward ever! This is another opportunity to be creative – you can use variations on children’s games, such as hide-and-seek, or come up with brand new games based on what you have available and your dog’s interests. For example, if you have a dog that absolutely loves balls, and you have enough room for tossing it, you can create games that involve the retrieve, as well as mixing in some basic obedience behaviors. Other types of games don’t even necessarily need to involve you, but can be just as mentally engaging. Toss some kibble around the room, or in your yard if it’s safe, and let the dog “hunt” for his food. You can even do this instead of using a dog food bowl entirely for each meal. There are many types of interactive food toys and puzzles that you can use as well for the same purpose and they are not all just “food dispensers.” For some, the dog has to really think about how to get the food out of the various types of openings. Another way to stimulate your dog’s mind is to simply bring him out with you during your regular errands. Getting to see new faces, new places and a ride in the car can be very mentally challenging for a dog and also helps to reinforce socialization. Try taking your dog on trips to new places neither of you have been as well. You don’t necessarily have to take him out on a long walk or hike – the experience of being outside and experiencing novel stimuli will be a highlight for your dog. There are many dog-friendly places you can bring your dog for an outing, such as local coffee shop and restaurant patios, home improvement and garden/nursery stores, pet supply stores, and even some large national chains (for items such as craft supplies and household goods). Always check with the store manager first, of course, and be sure that your dog can handle showing his good manners off in a crowd of strangers.